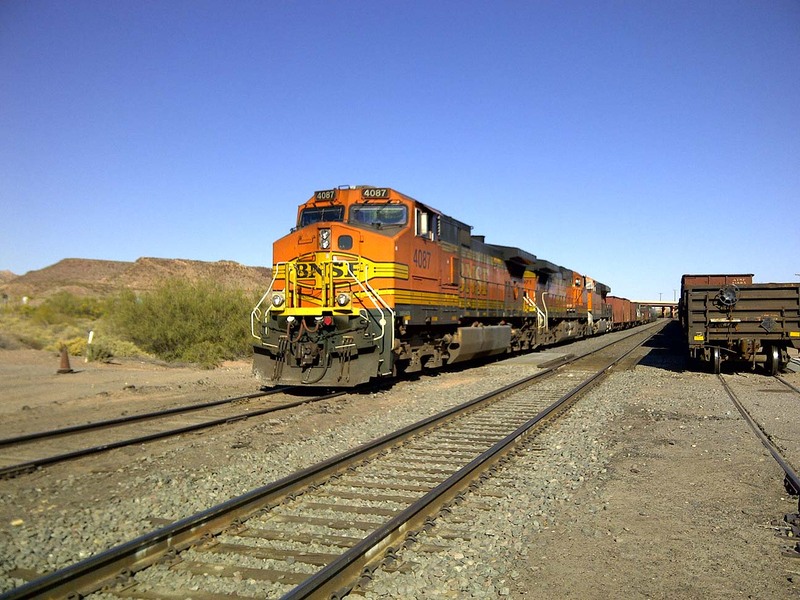 These action views are grouped by BNSF division and/or subdivision. Keep scrolling for more geographical sections. 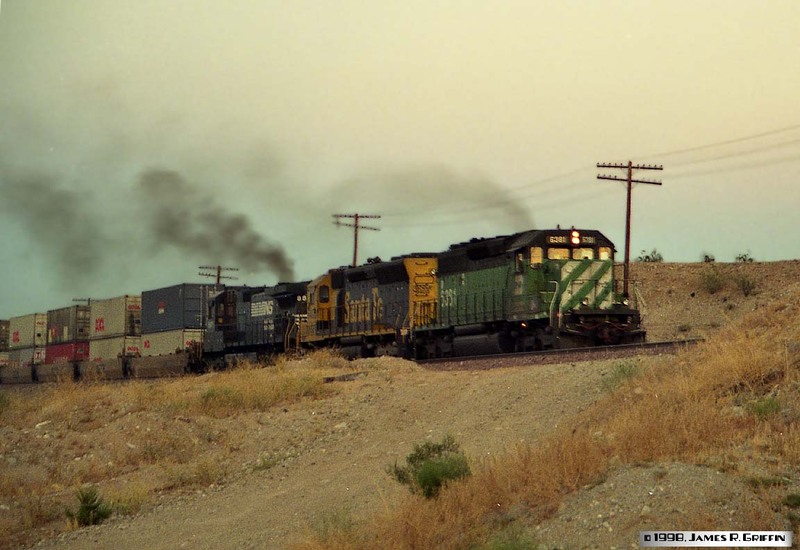 An eastbound stack train is between Becker and Abo Canyon on October 11, 1997. From left to right, this consist approximates the merger experience. Eastbound stack train, with a pair of newly-painted Heritage C44-9W’s on the point, rolls into Needles, CA on May 23, 1998. At this time, heritage-scheme units were a tiny minority of the population. 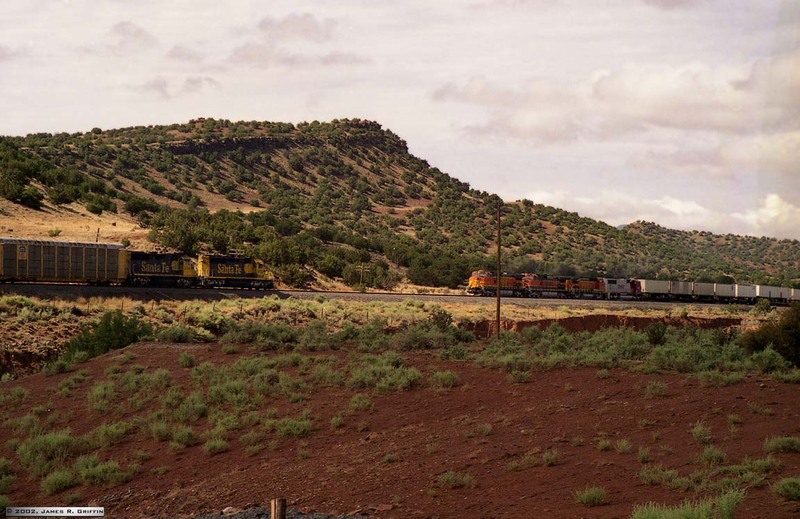 An eastbound manifest passes through Thoreau, NM in April 2000. The trailing C44-9W (No. 4716) is one of the last delivered in the Warbonnet scheme. 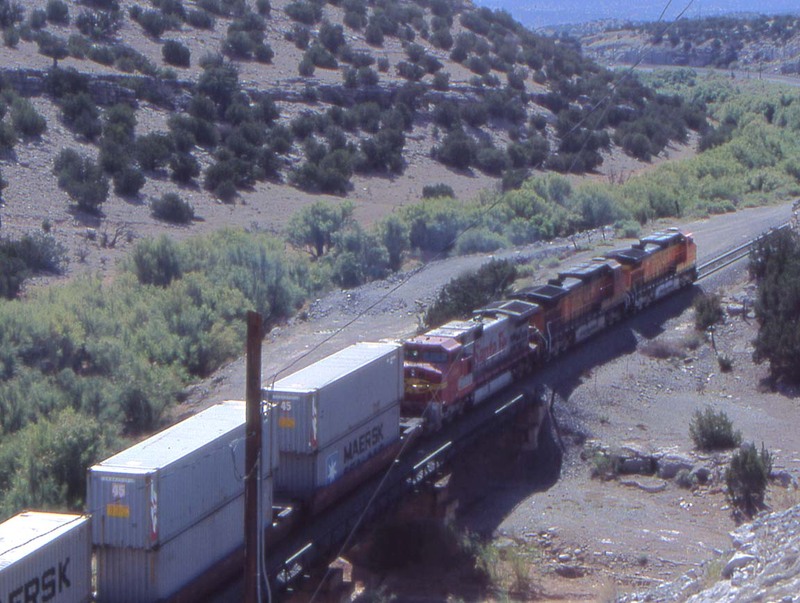 Two trains meet in Abo Canyon just above Scholle in July 2002. 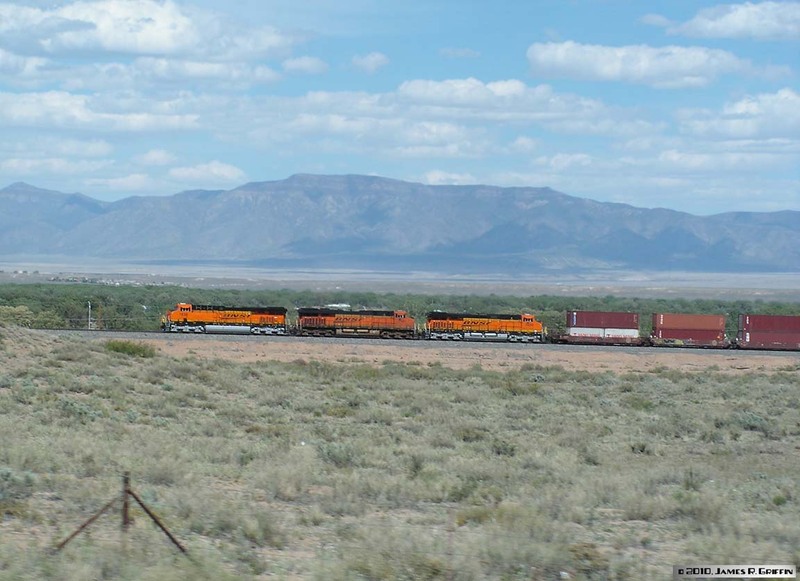 The one at left is a westbound autorack movement with a couple of blue/yellow warbonnet EMD units for power, whereas the eastbound pig train is all-BNSF power. 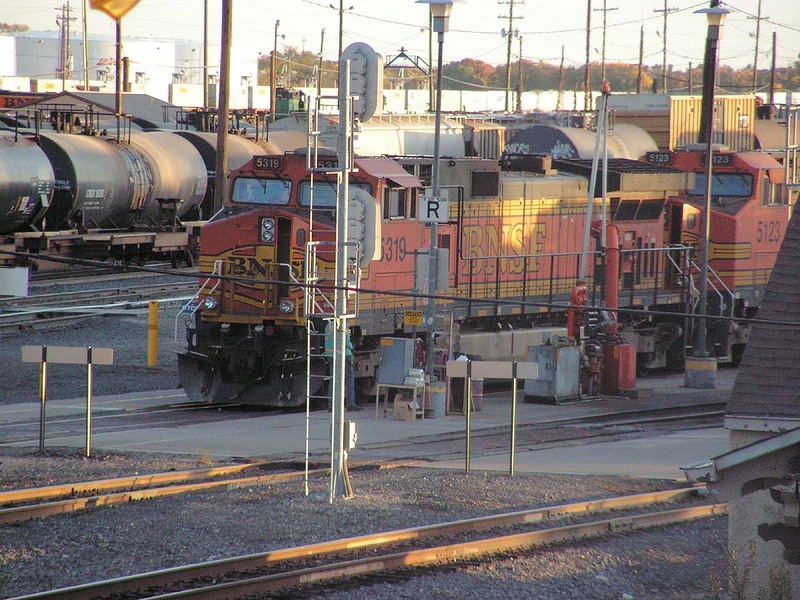 Of particular note is the trailing bluebonnet on the left– it is one of the rare GP40X units, No. 3036 (ex-AT&SF 3806). Note the flared radiators. 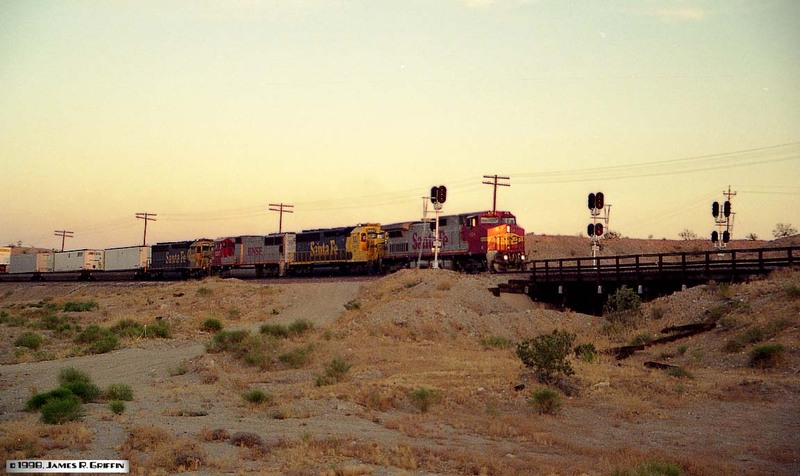 A trio of C44-9W’s take an eastbound stack train up the grades through Abo Canyon in late July 2002. The trailing unit is still in full Santa Fe paint. They’re crossing the 7th and final bridge in the canyon. Much of the hill I was standing on has since been removed to create the second track alignment through the canyon. 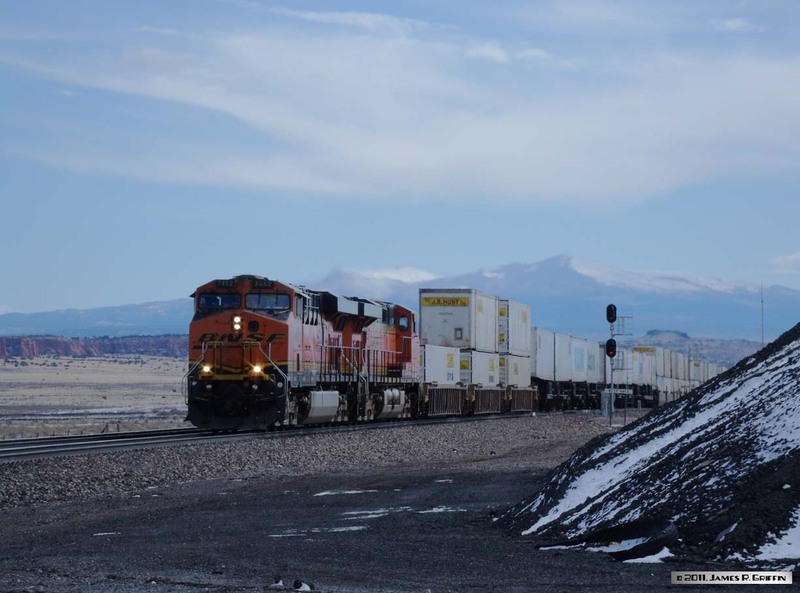 The Transcon is not known for its coal traffic, but such does exist. Here, on a gray January 9, 2014, a westbound coal train is draped around the serpentine curves coming into the Belen yard. A pair of SD70MAC’s wearing H2 paint are tacked on as rear remotes. 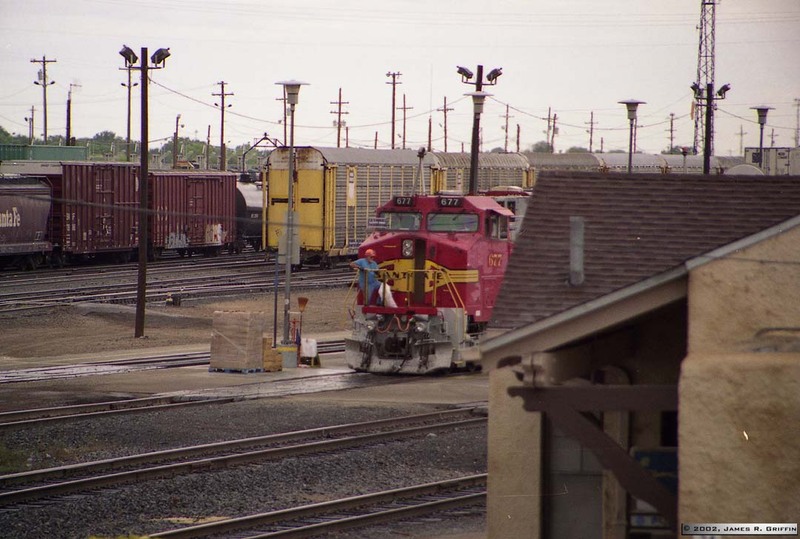 TOP: An eastbound hotshot intermodal train pauses at the north end of Belen yard, near the depot, for a quick crew change. BOTTOM: As soon as the new crew is aboard, the train moves off to the east, without any kind of service stop. 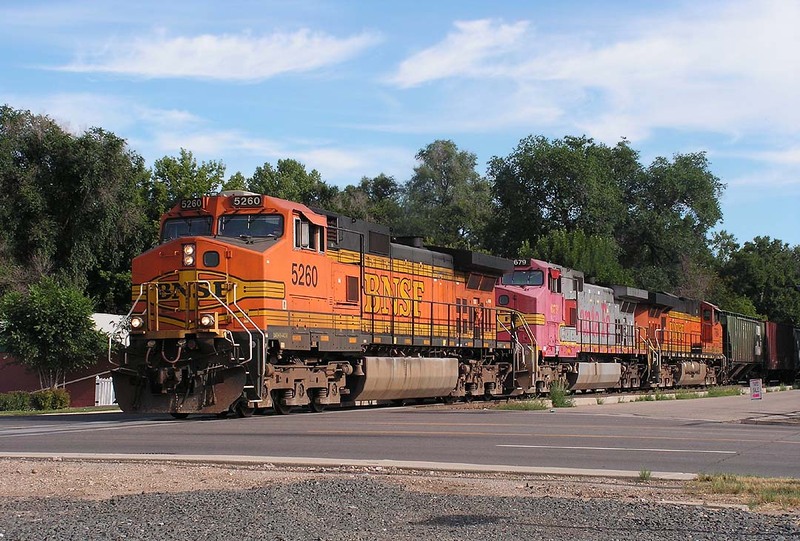 Note the colorful mix of power, always a delight during this period of BNSF history. 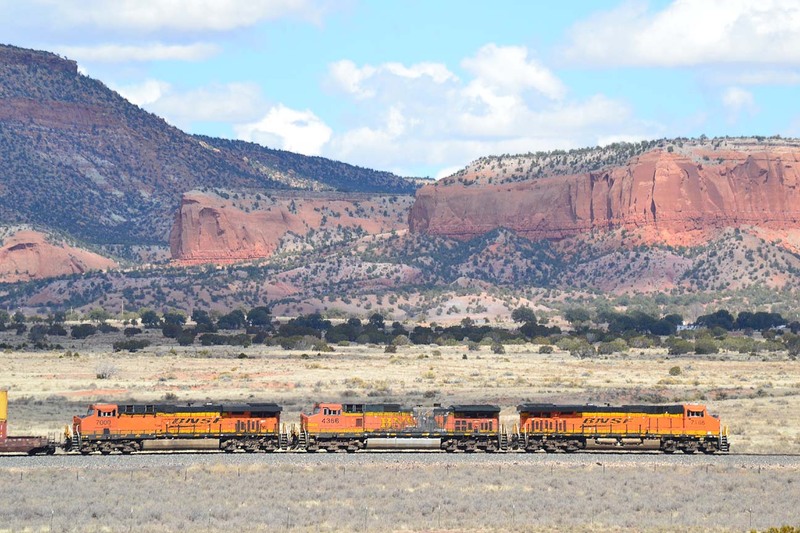 Note that, despite four different paint schemes, every unit on the train is of Santa Fe heritage. 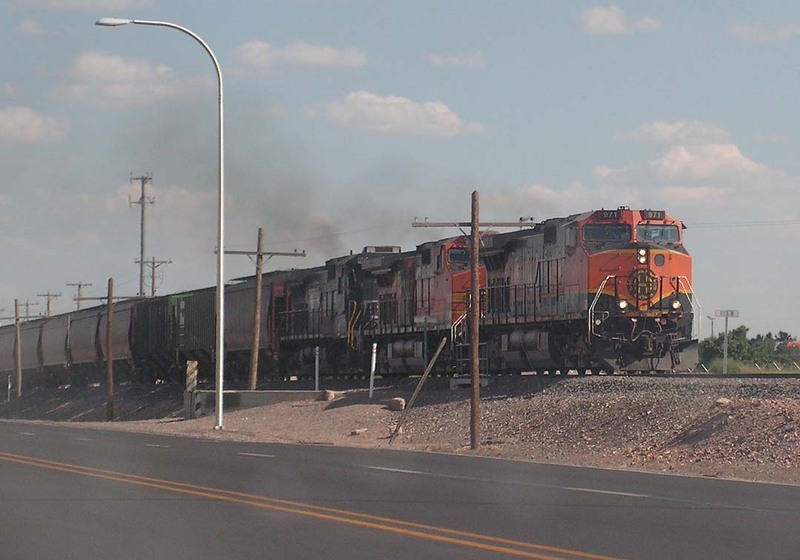 The evening of June 12, 2004, finds a freight departing Kingman, AZ with C44-9W’s 1030 and 4886 on the point, and a lease Dash 8-40C and ex-BN FURX SD40-2 behind. The train paused to drop off a couple of cars at the industry in the background before heading east. 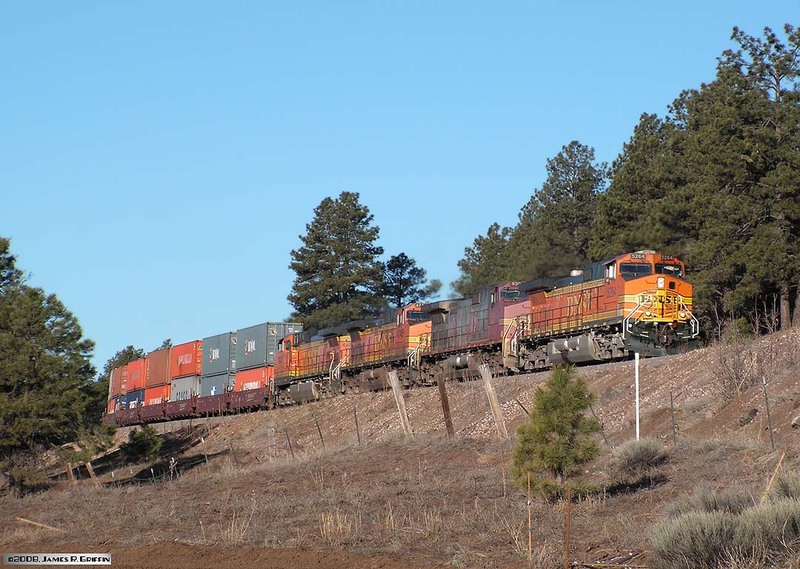 An eastbound doublestack train approaches Flagstaff from the west on the morning of March 27, 2008. The area around Flagstaff is high and beautiful (7,100 feet at this spot), with severe winter weather at times, but is slowly succumbing to development. 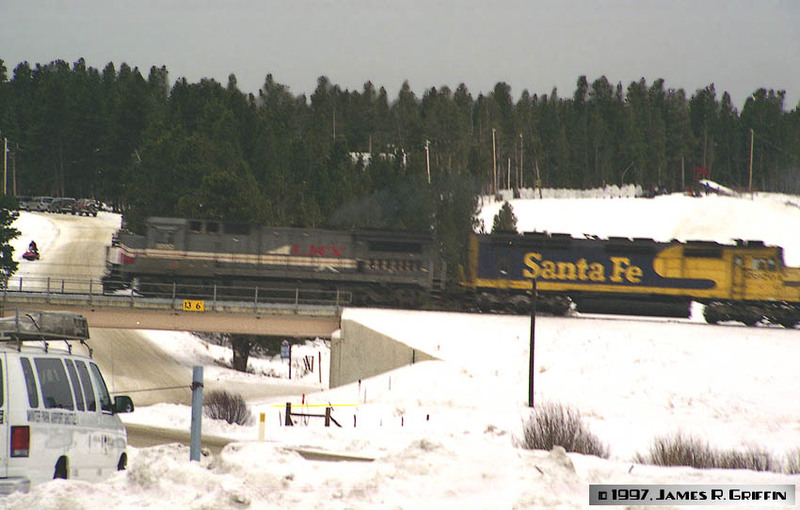 East of Flagstaff, C44-9W 4488, repainted New Image No. 727, and H2 No. 5149 are heading an eastbound intermodal train on 3/27/2008. 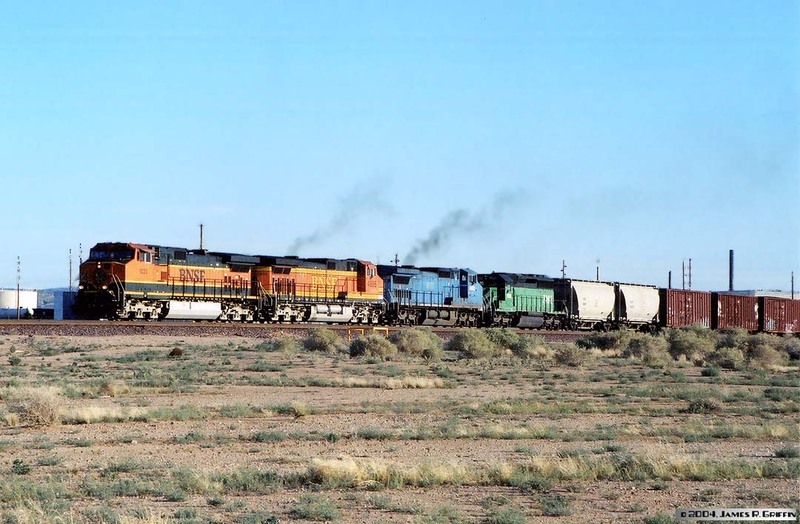 In a scene repeated uncounted times, three C44-9W’s in the 4000 series roll an eastbound stack train across the high desert near Winslow on 3/27/2008. 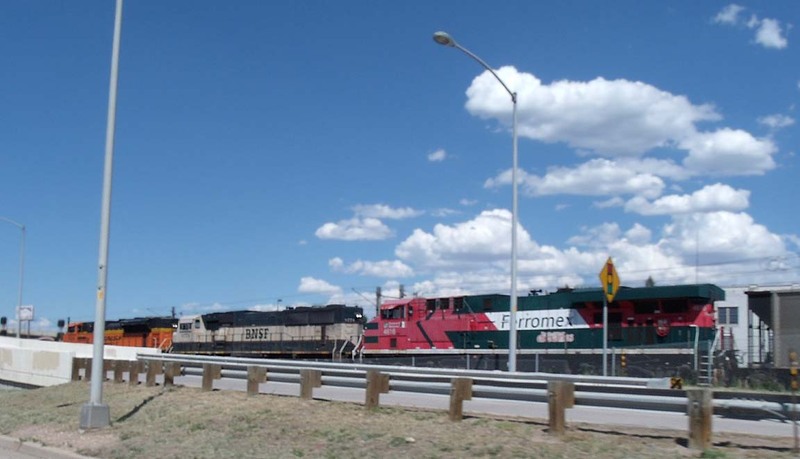 In a nice bit of good timing, a westbound stack train approaches the underpass with Interstate 25 near Belen on May 9, 2010, at the same time and speed as me. This train is powered by a trio of ES44DC’s (7836, 7581, 7839). I see trains here frequently, but photography rarely works out. 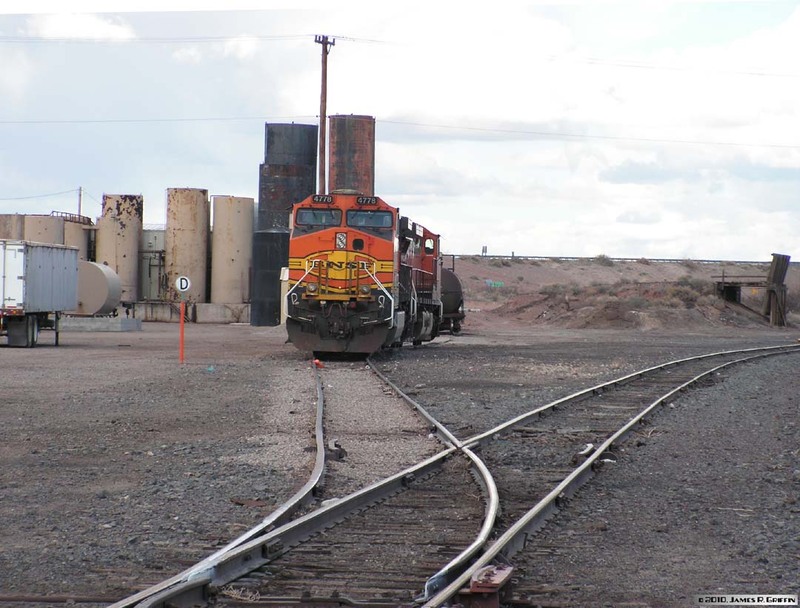 This interesting set of remotes was tacked onto the rear of a westbound coal load at Gallup on 2/21/2011. 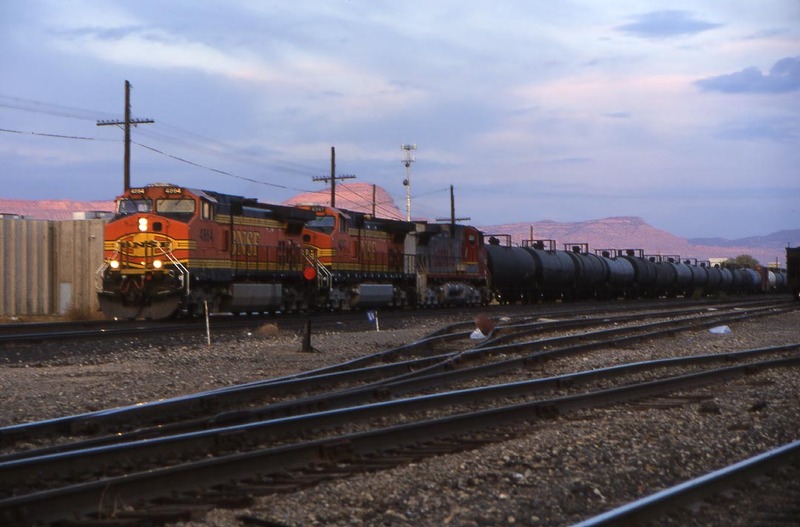 The three units include a pair of SD75M’s (one a full Warbonnet). The C44 must be there to be the control unit. On the head end were three ES44DC’s, so the whole train was DC powered (as opposed to AC traction, more common on coal drags). 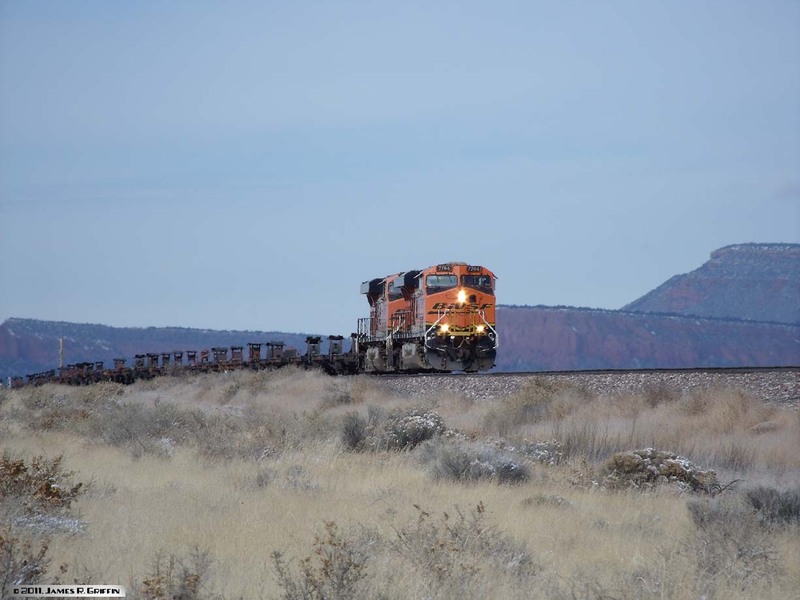 Just east of Prewitt, a freight flies eastward on 1/09/2014 behind three generations of GE power. The leader is ES44C4 No. 6843, followed by faded Santa Fe alumnus No. 876 (a Dash 8-40C from 1993), and trailing is C44-9W No. 4394 (built 1999). 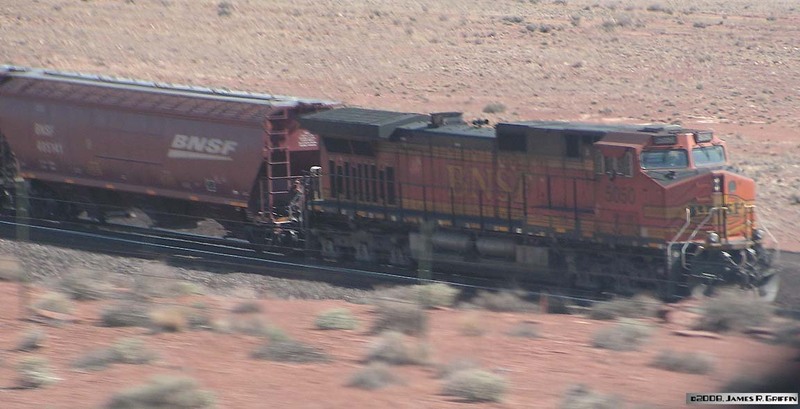 The iconic red cliffs form a stunning backdrop for the train. 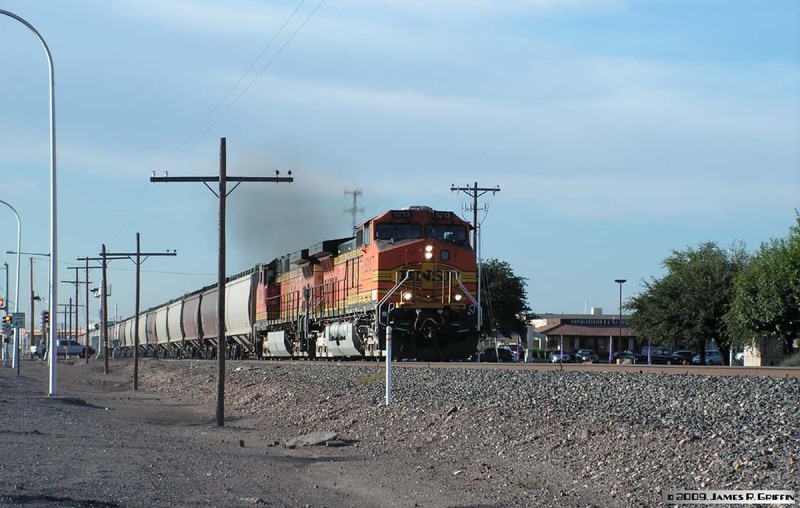 The crew is boarding a grain train at Belen on 8/18/2007. C44-9W No. 4038 and its Warbonnet mate will be heading south towards El Paso shortly. 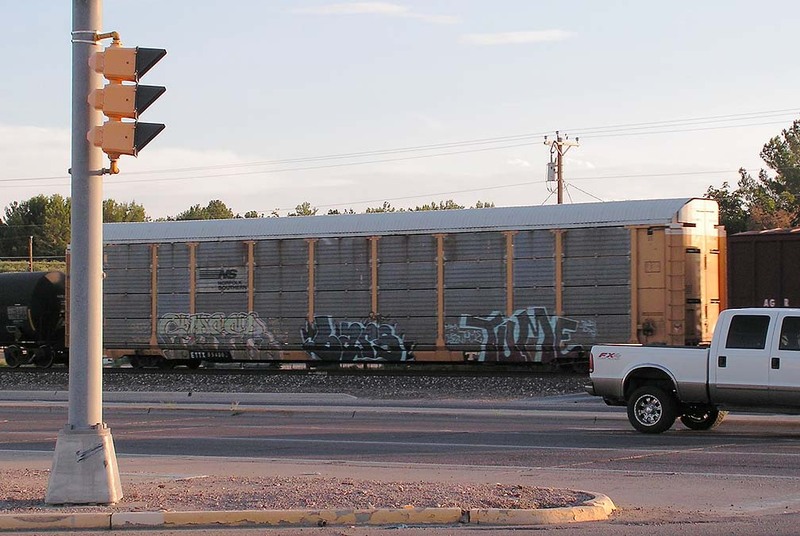 Hopper cars spotted around the wye at Socorro on 4/29/2009. These mostly older component-road hoppers are in perlite service, serving Dicaperl Minerals. Old AT&SF depot at Rincon, NM. This structure sits across the tracks from the community, a curious placement in my opinion– need to find out more of the history of the site. 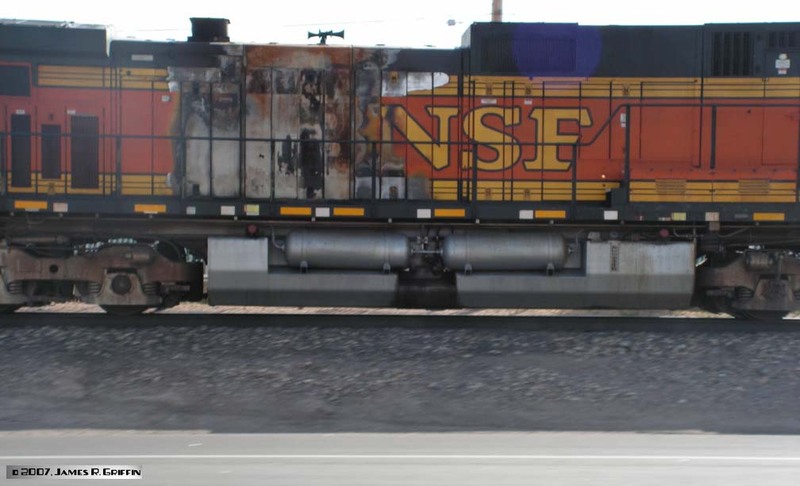 BNSF still uses the structure, although obviously not for passengers! Engine spur at Rincon. The power for the local usually ties up here. Rincon serves as the interchange point with the Southwestern Railroad. The local switches industries in the area down to Las Cruces. One can usually find a pair of locomotives parked here on weekends, just off Interstate 25. 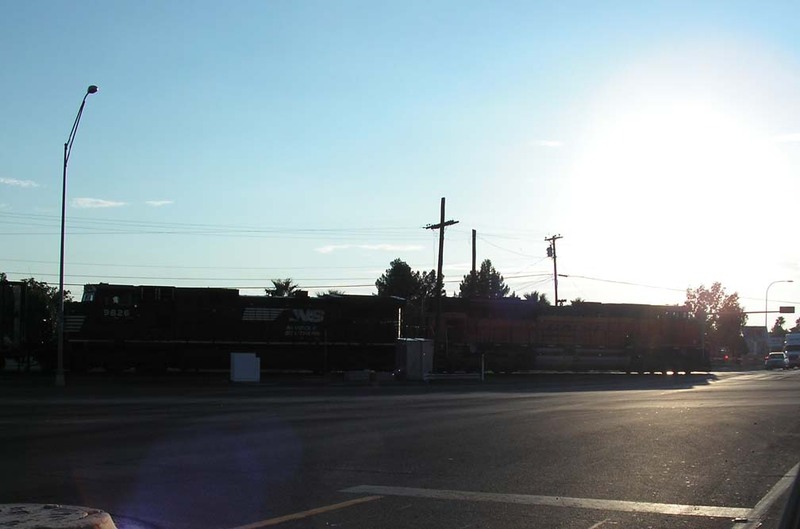 A northbound grain train rolls along Main Street in Las Cruces on 8/11/2009. The pair of C44’s is handling the long train of empty covered hoppers with ease. Old AT&SF depot at Mesilla Park, NM. This structure is located on Main Street, essentially sandwiched between the cities of Las Cruces and Mesilla. 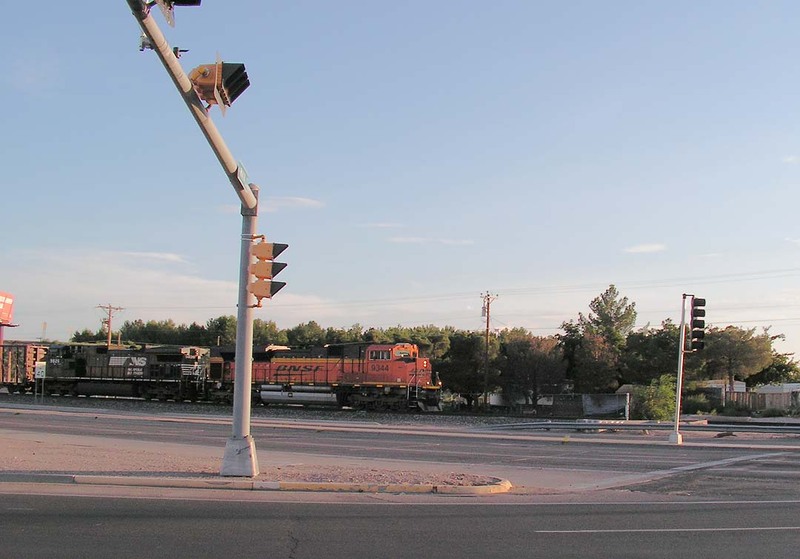 Though no longer used for passengers, the BNSF has an active maintenance-of-way presence at the site. 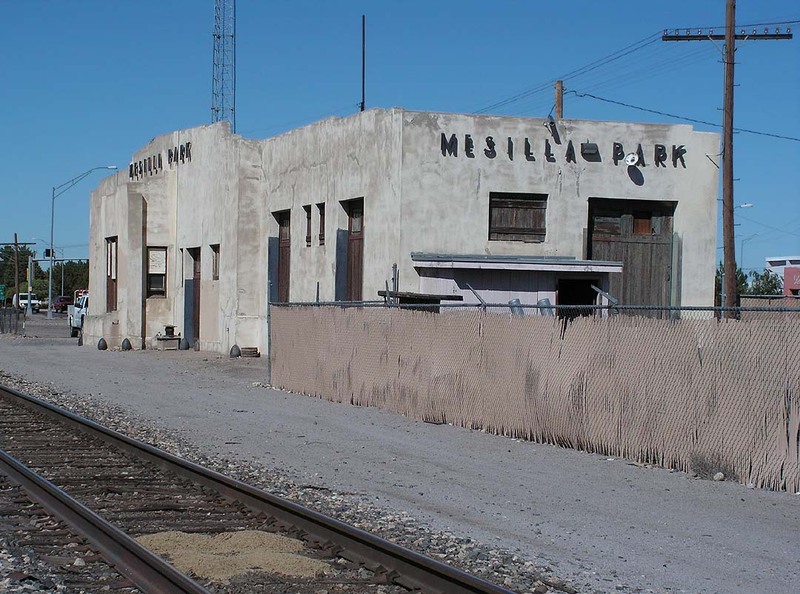 Sidings at Mesilla Park, opposite the depot (above). Some kind of agricultural shipments go out here, though I haven’t been able to determine what. There is a portable conveyor loader on the grounds. In this shot, the tan building in the background is currently vacant. Not sure who owns the warehouse behind it, there is a real lack of signage in the area. But there were three hoppers spotted here on 11/01/2009, so there is definitely some activity. 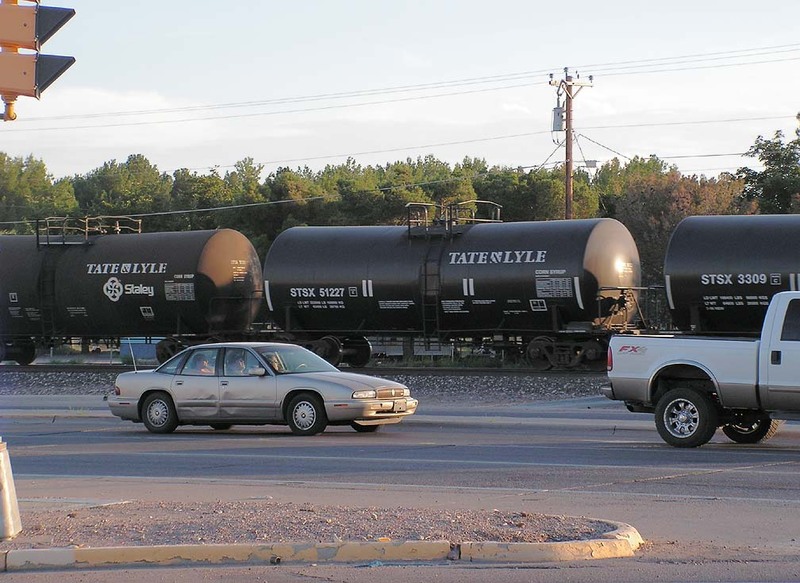 The next six photos are of a single northbound train in Las Cruces, crossing Valley Ave. The train was an interesting mix of power and rolling stock, common on this subdivision. Silhouette shot as the power crosses the street. The train was a great mix of cars, including a large number of CN boxcars, various corn syrup tanks, coil steel cars, and even this stray autorack car. 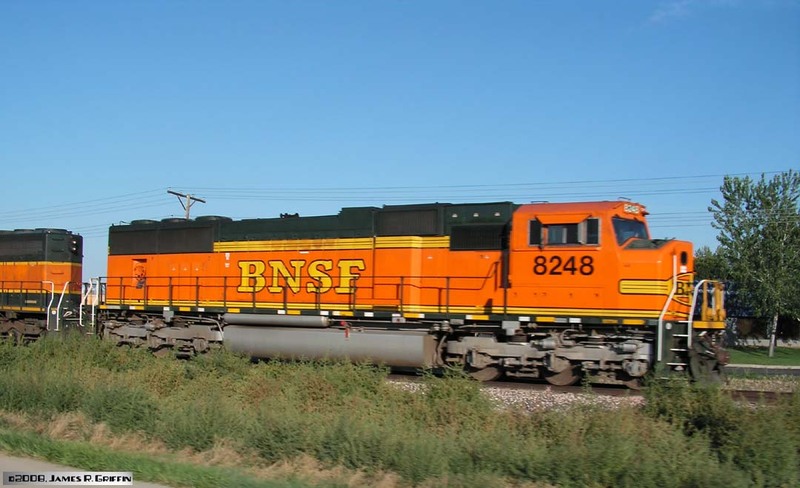 Here are some BNSF hoppers, of old and new logos. Several cuts of corn syrup cars were present. And to punctuate the matter, an articulated double-stack car brought up the rear. This is not uncommon for these trains. 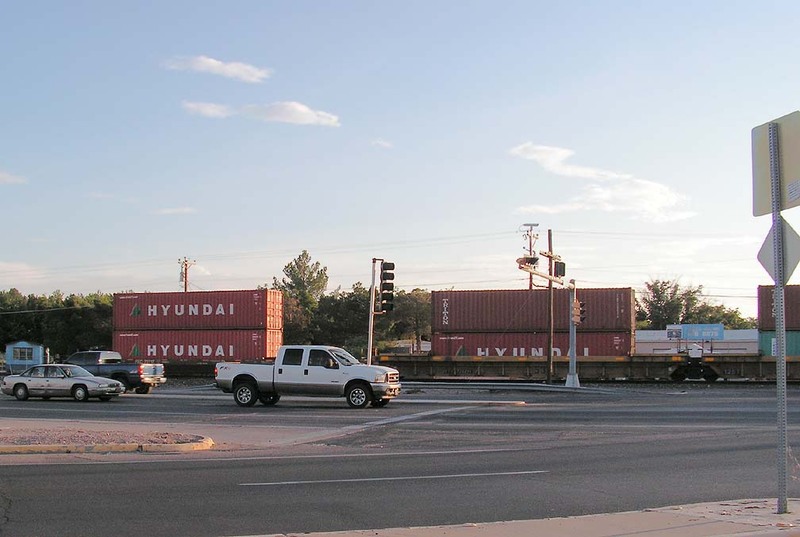 Something different and interesting: a southbound autorack train in Las Cruces on Easter Sunday 2015, with two borrowed UP units trailing the leader. In order, we have: ES44AC No. 6127, then UP SD70ACe No. 8847, then former Southern Pacific No. 262 (now patched to UP 6307). 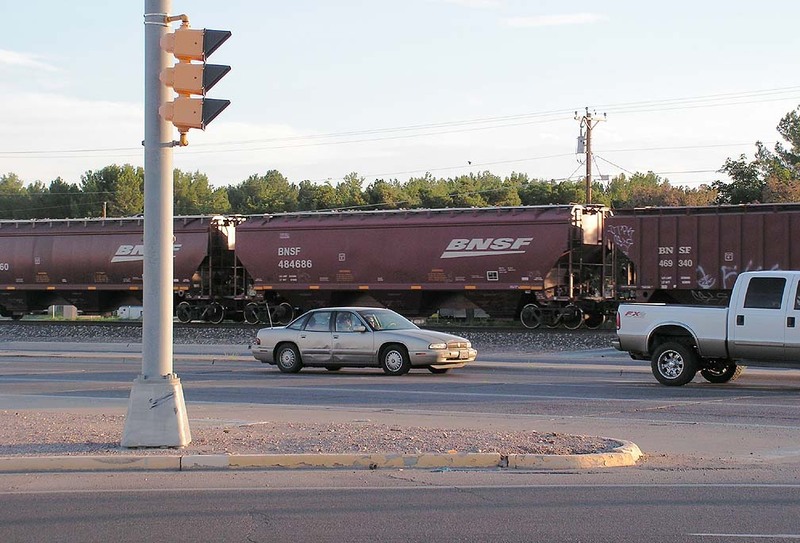 As a condition of the 1996 Union Pacific buyout of Southern Pacific, BNSF was granted trackage rights over several portions of the new UP system, including between Denver and Stockton on the UP’s Central Corridor. 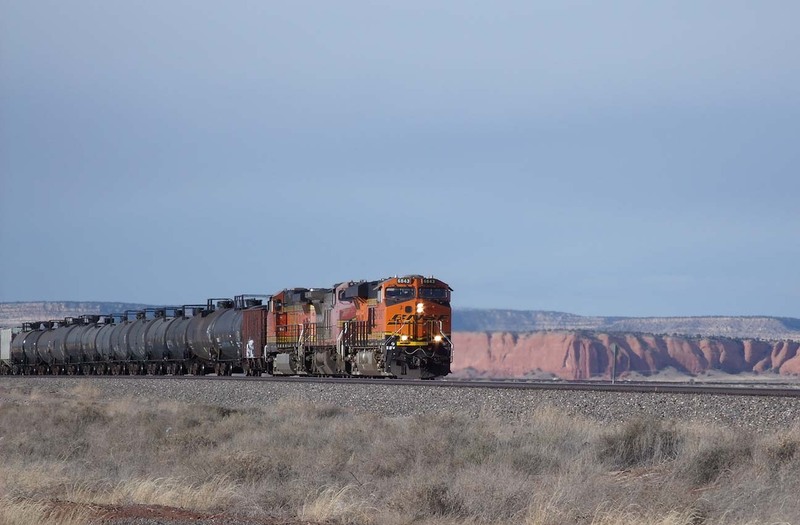 BNSF has typically operated one or two trains each way daily, with a few additional trains on special occasions (such as sand trains, oil trains, and rare coal trains). 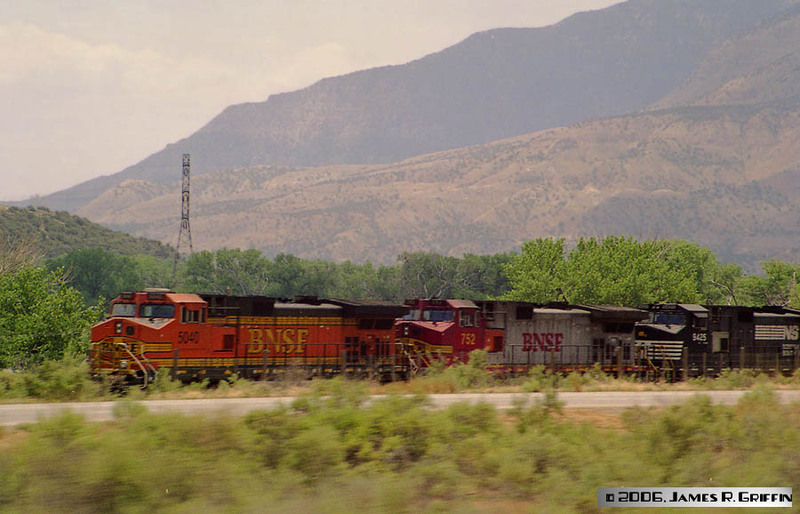 In December 1997, we were in Fraser, CO and saw an eastbound BNSF trackage rights train. 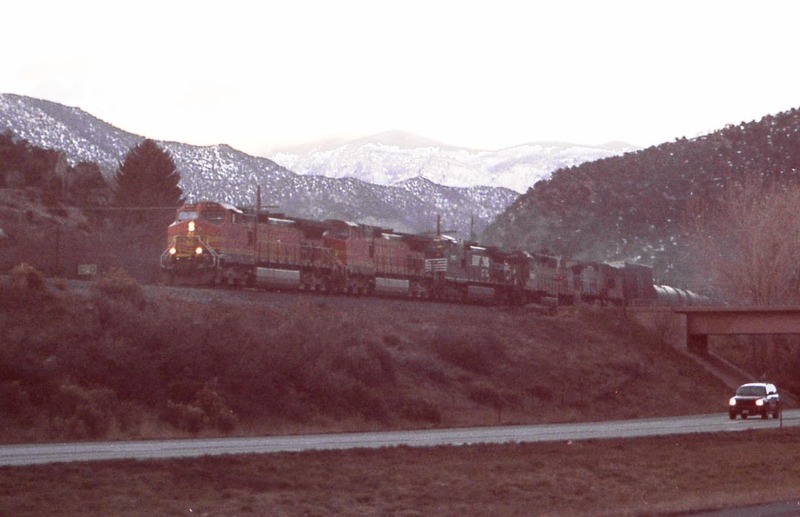 It had seven units of highly mixed background: three were BN, two ATSF, one LMX lease unit, and a SOO. Same train; here the head end is crossing the overpass at county road 72. Those cowl units were rare in 1997– this one was retired about ten months later. See the BN Tribute for more photos of these units. 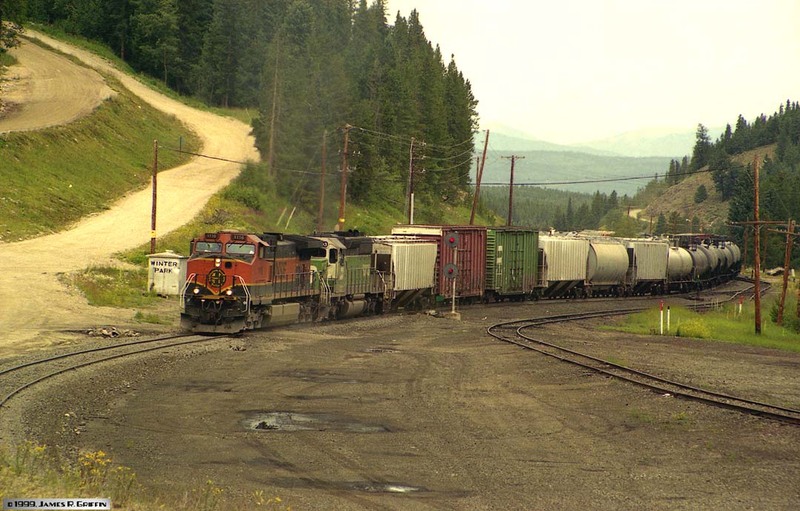 An eastbound manifest freight approaches the west portal of Moffat Tunnel on August 14, 1999. The train is a bit underpowered, with only C44-9W No. 1116 and a white-face SD40-2 on the point. This is in the third year of trackage rights on this route. 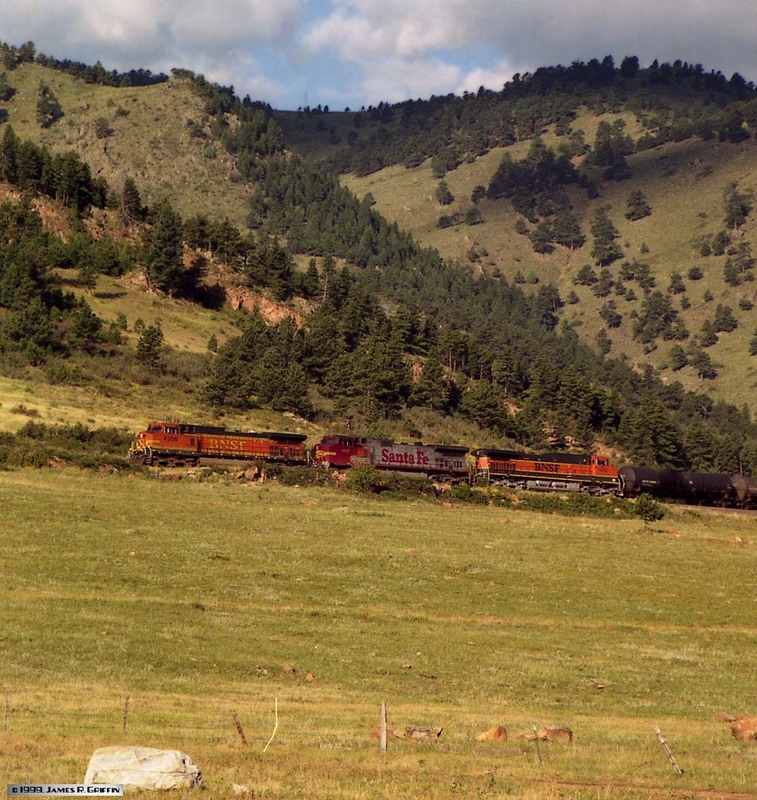 An eastbound manifest freight exits Coal Creek Canyon near Clay siding, on September 4, 1999. 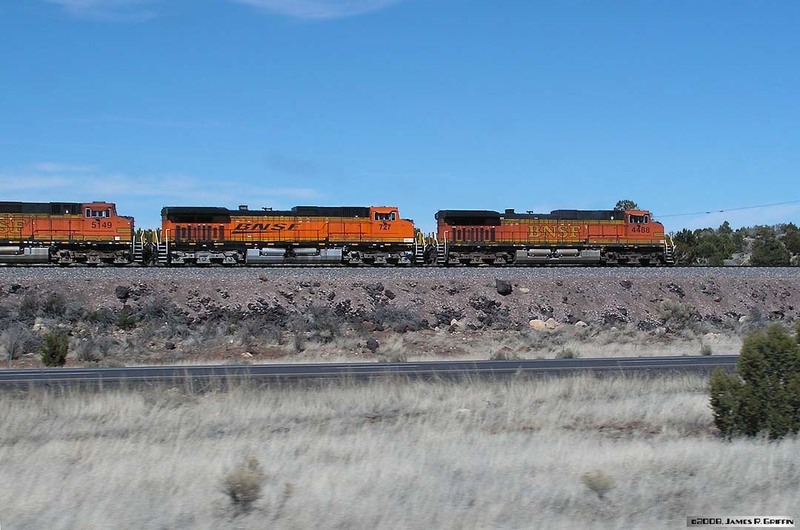 The BNSF train will take the siding in order to allow a westbound CSUX coal empty to pass.The train has a typical colorful consist, with an H2 leading, a stock ATSF warbonnet second in line, and an H1 trailing. 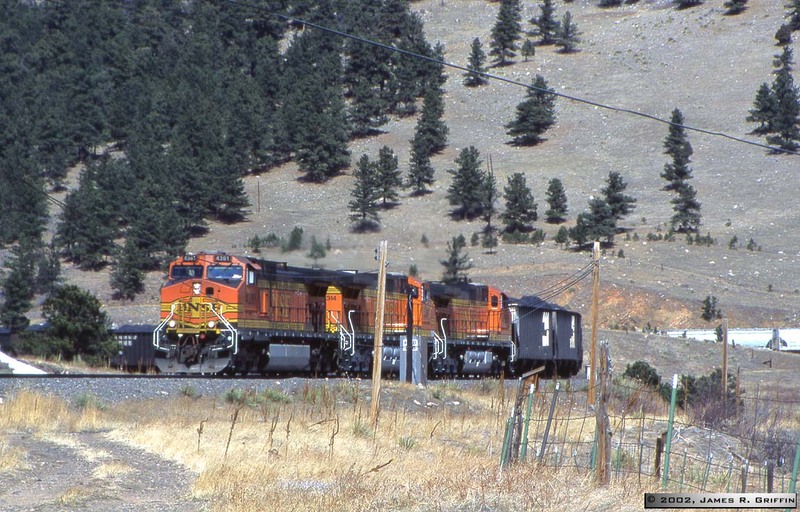 In a fairly rare movement, an eastbound load of Utah coal is headed through Glenwood Springs on August 7th 2001. The top photo shows the three-unit swing DPU set and the bottom image is the lone rear DPU. 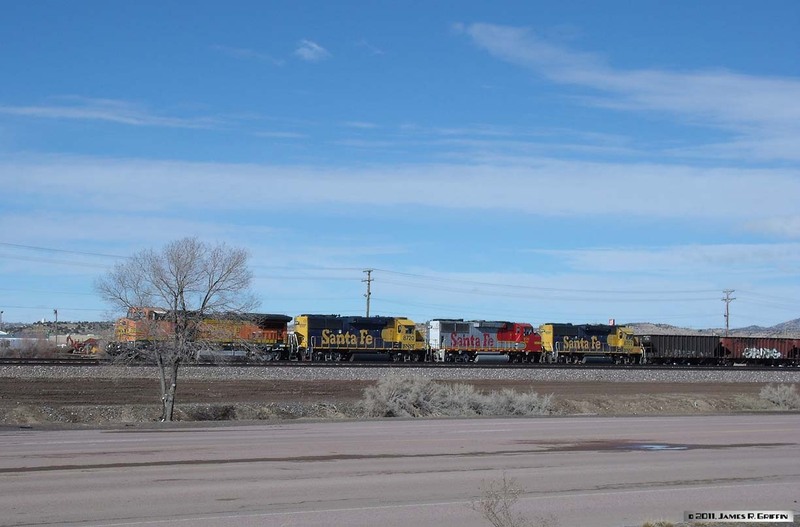 All locomotives are SD70MAC’s and the cars are a variety of BN-heritage hoppers. 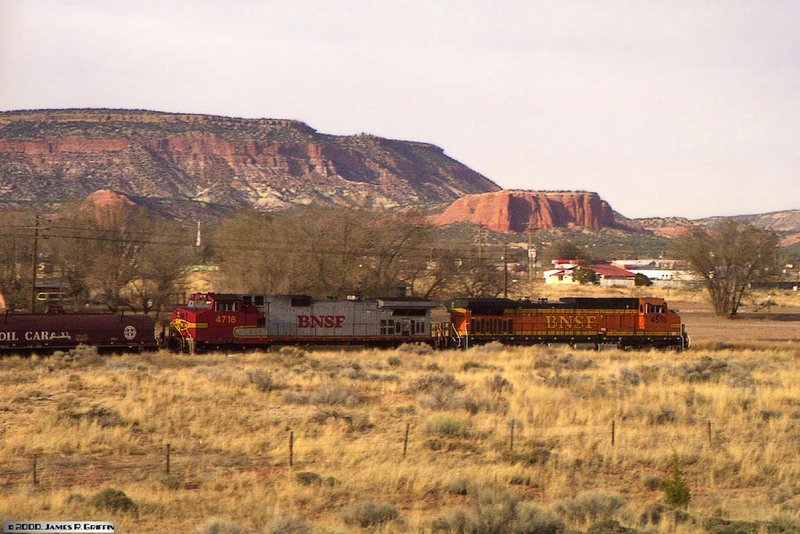 A westbound freight pauses at Grand Junction to change crews on the evening of November 11, 2001. An unpatched Santa Fe C44-9W is running third on this train. accessible place to watch trains (I’ve photographed from there as far back as 1982). This was a period of transition. 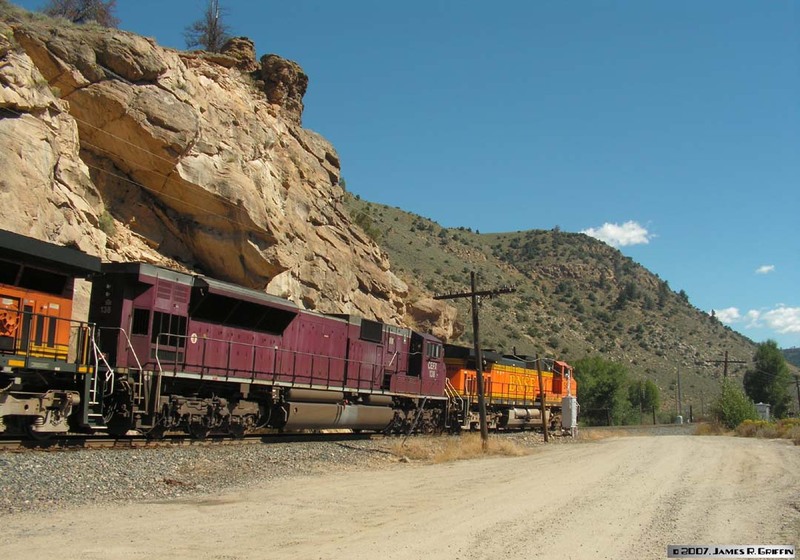 BNSF had been using a manned pusher (helper) from Denver up to the Moffat Tunnel since 1996, but by 2003 had started to transition to unmanned remotes. 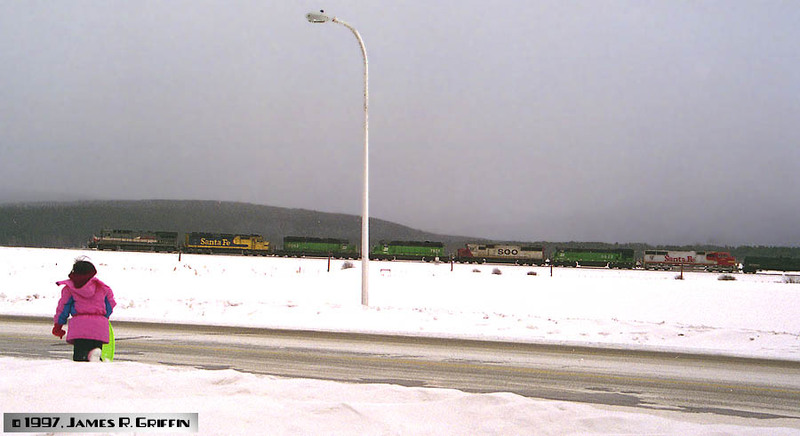 A quick grab shot through the windshield of a westbound freight exiting North Canyon near Silt, on January 4, 2006. The consist includes a pair of H2’s, a borrowed NS unit, an SD40-2 of BN heritage, and an unidentifiable GE. 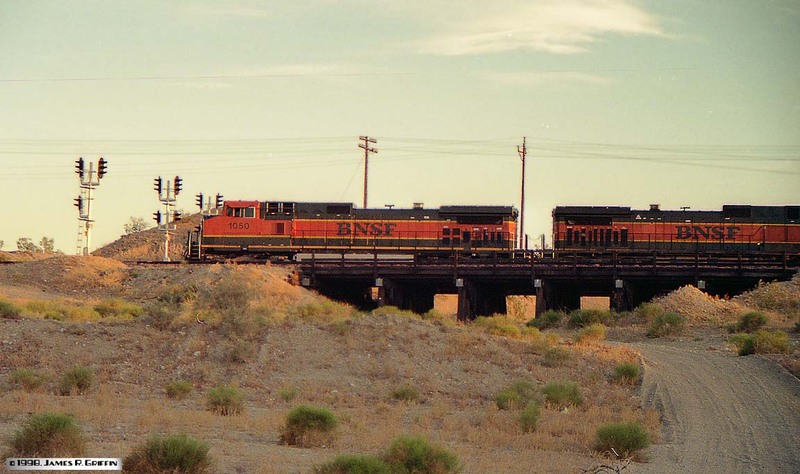 An eastbound BNSF freight stops to perform switching chores at the soda ash yard near Rifle on July 1, 2006. 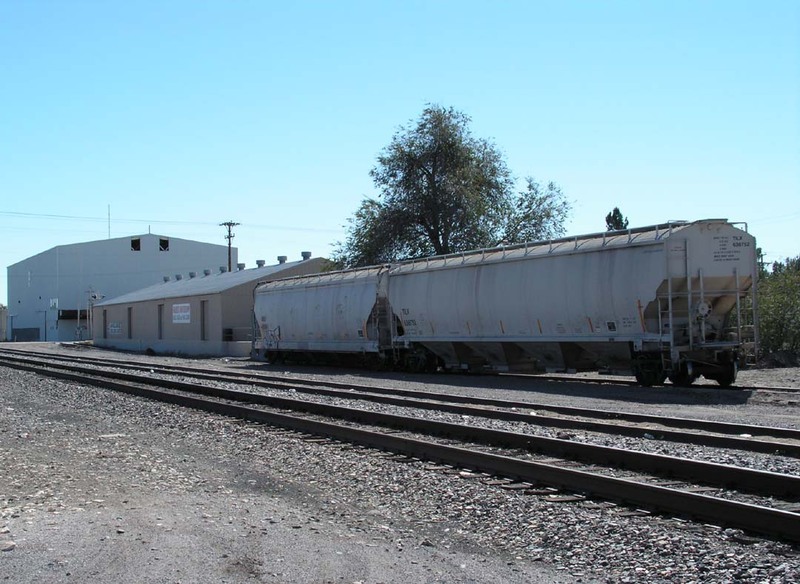 BNSF paid for the construction of this yard, even though it is captive to the UP, since the customer’s contract is with BNSF. Note the NS unit in the consist. 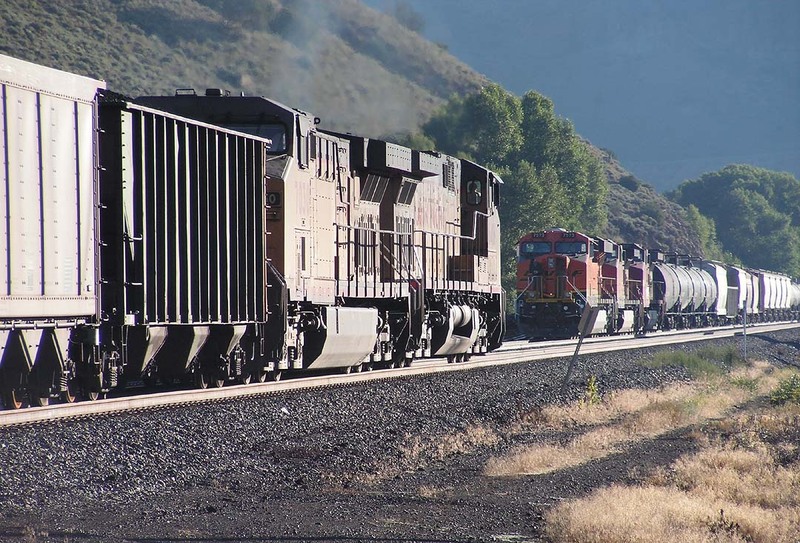 On the morning of August 9th, 2007, a westbound BNSF freight is holding in the siding at Hot Sulphur Springs for an eastbound UP coal train. 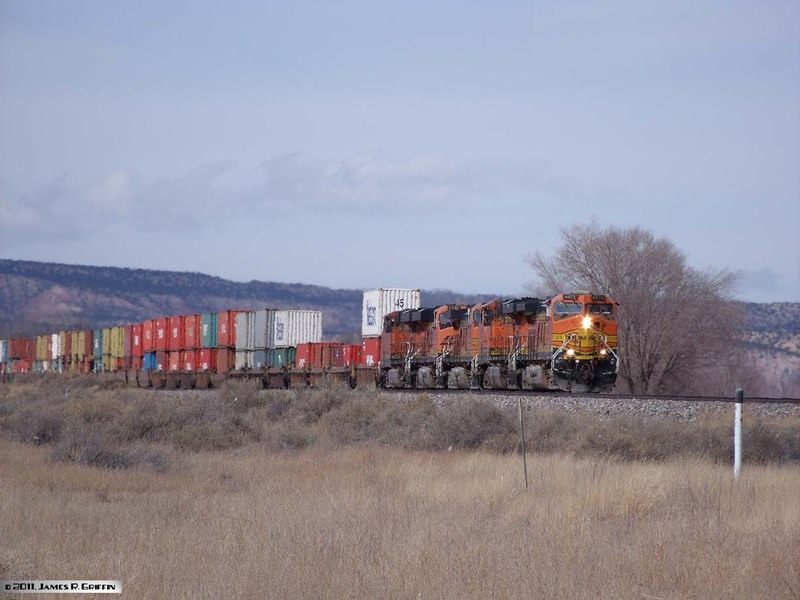 Top photo: the UP train is approaching as the BNSF crew prepare to do a roll-by inspection. 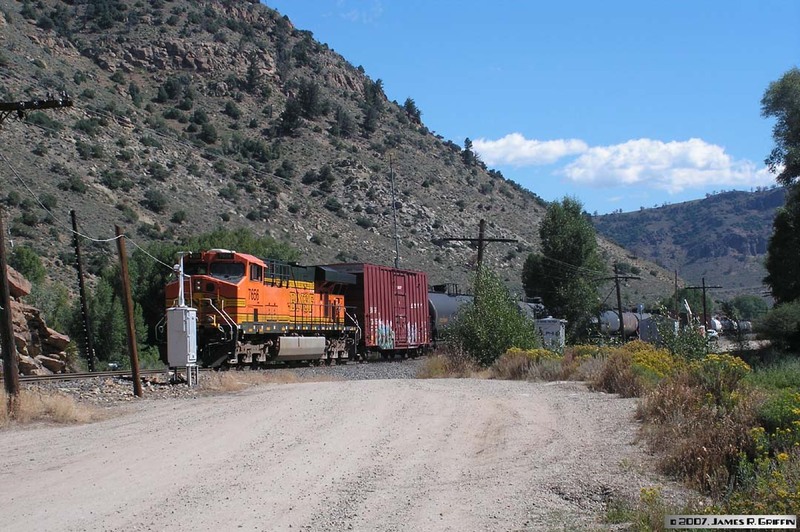 Bottom: the BNSF train throttles up and heads towards Byers Canyon. It’s led by an ES44DC in the new image scheme, with a pair of C44-9W’s in the H2 and warbonnet schemes. Three hours later, an eastbound BNSF train came out of Byers Canyon and headed east through Sulphur.Top: It was led by a pair of C44-9W’s spliced by a CEFX SD90. Bottom: There was an ES44DC in H2 paint pushing on the rear (DPU helper). This new unit was delivered just barely too early to receive the New Image paint scheme. 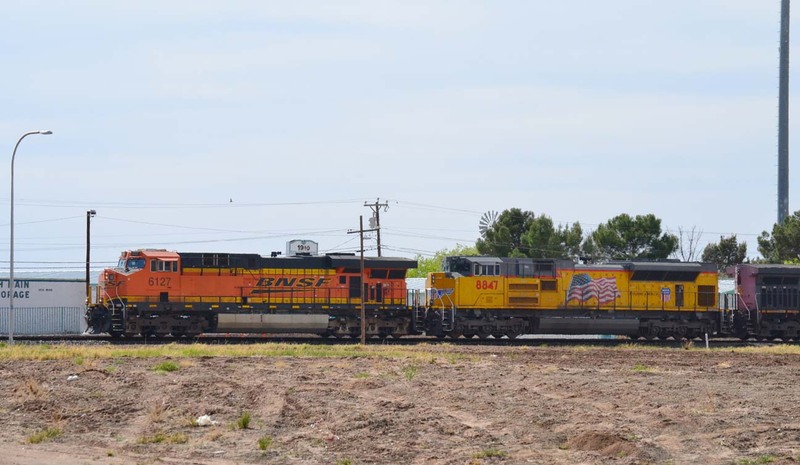 A yard transfer job has picked up a cut of cars in UP’s North Yard in Denver and is headed back to the BNSF yard to the south-east. Both the FURX SD40-2 and the ES44DC are pointed the wrong way, so the conductor and brakeman are riding on the porch of the lead unit. 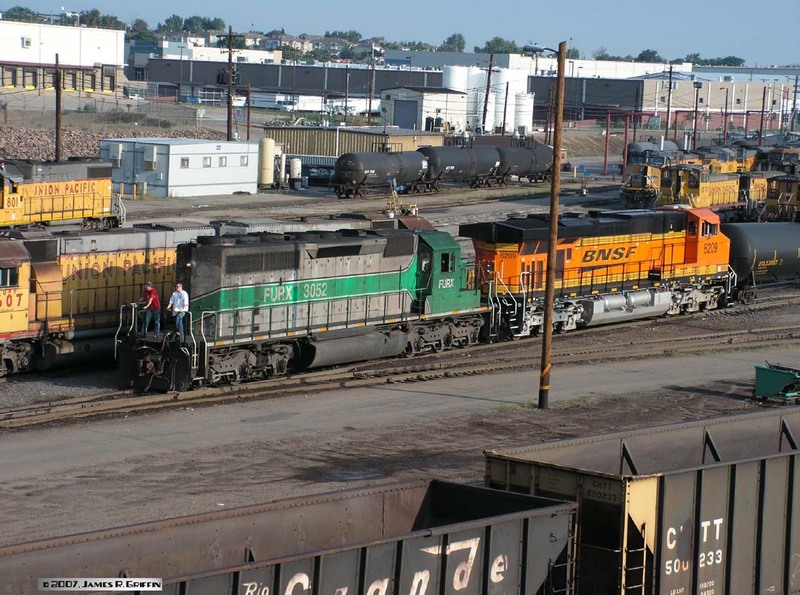 Near the BNSF shops in Denver, an interesting power consist is being repositioned after bringing in a train on the Brush sub. Including the ex-ATSF unit at left, we have three C44-9W’s in both Heritage schemes, an ATSF blue/yellow warbonnet GP35, a BN SD40-2, and an ex-ATSF GP60B in H1. 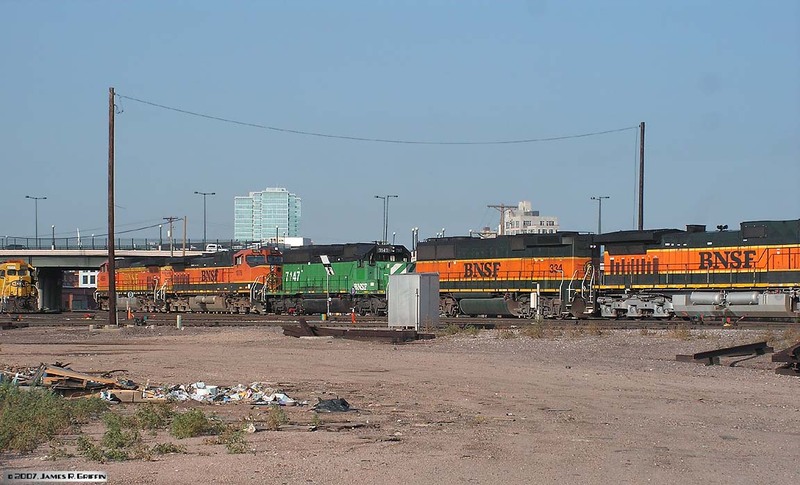 BNSF is great for variety! SD75M No. 8248 is paired with SD40-2 No. 6974 as they run light out of Longmont towards Boulder on 8/30/2008. They are working as the Longmont switcher this evening. 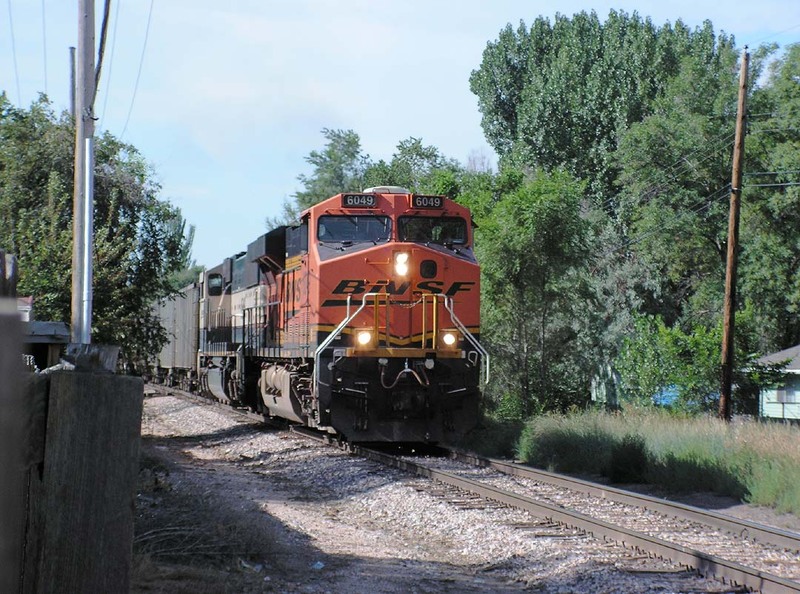 A southbound freight (probably the H-LAUDEN) crosses 3rd Avenue in Longmont on 7/31/2010. The three-unit consist includes a nice surprise– an ATSF Dash 9 still in her original paint. No. 679 is pretty faded but still classy. 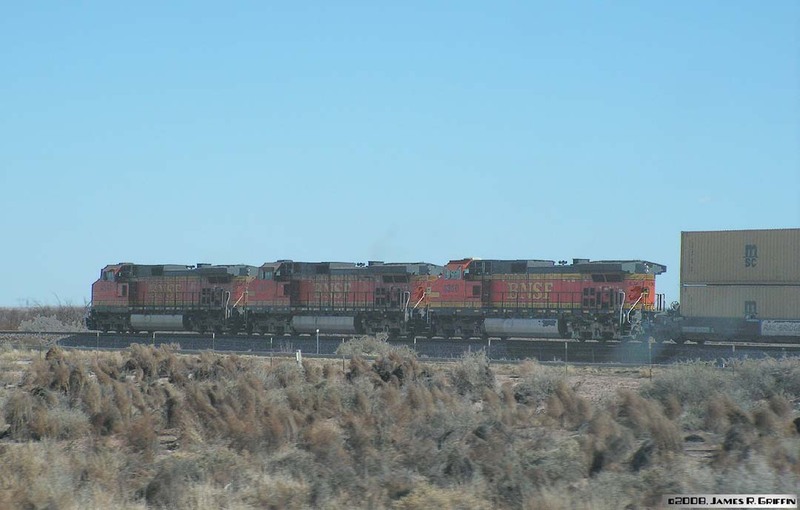 The leader is a standard BNSF Dash 9 in H2 and an ES44DC also in H2. 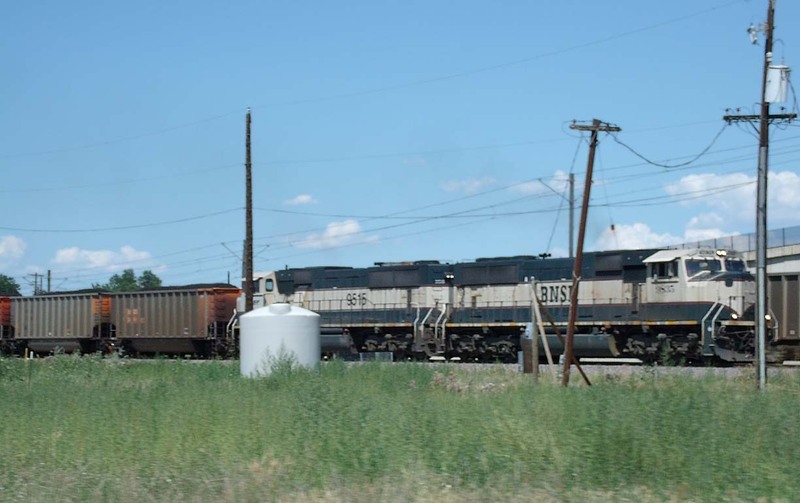 The following day (8/01/2010), a northbound coal empty is approaching 17th Avenue in Longmont with a mix of old and new on the point. 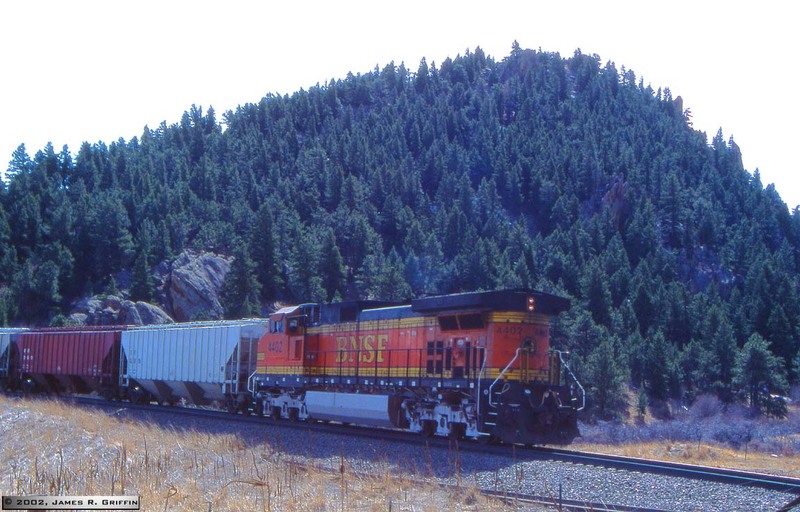 The ES44AC is four years old, and the SD70MAC behind is wearing the original “Executive” scheme it received in January 1995. Now it has the wedge BNSF herald below the cab window, however. This pair of SD70MACs in the Executive green scheme lead a southbound coal train through Littleton on 7/31/2011. The lead unit (9835) was actually delivered in March 1997, but the trailing unit (9515) is of BN heritage; it arrived in January 1995. 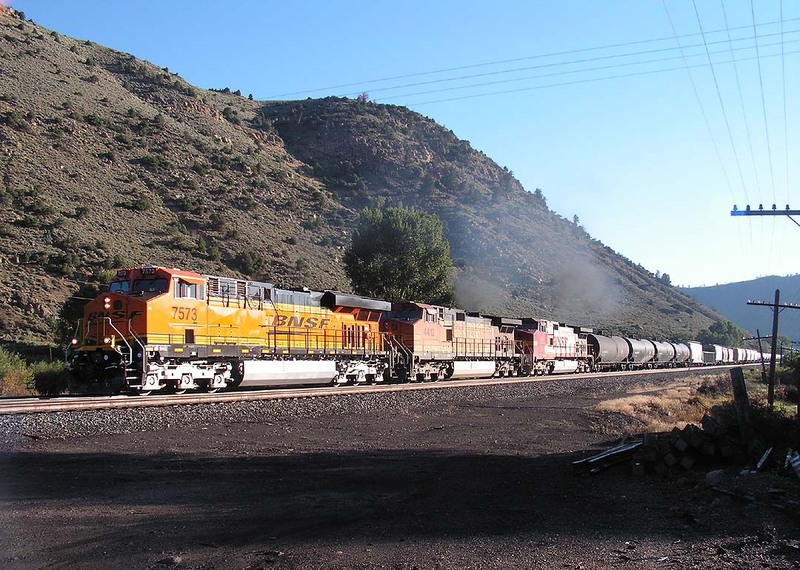 This colorful mix of power featured a visiting Ferromex AC-traction unit, an SD70MAC, and leading with an SD70ACe. It’s in Littleton on the Joint Line on 7/31/2011. 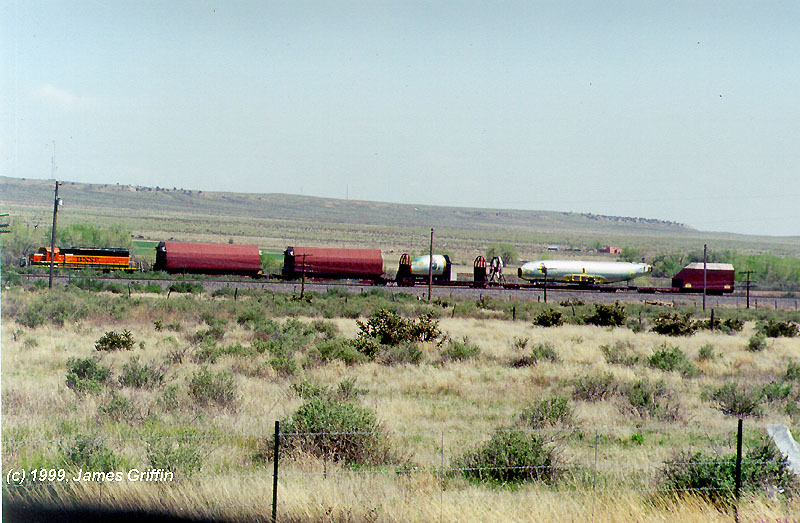 In a photo from May 14, 1999, a short Boeing train is headed up the Joint Line north of Pueblo. These trains move 737 fuselages and parts from the Wichita plant to Seattle for final assembly.